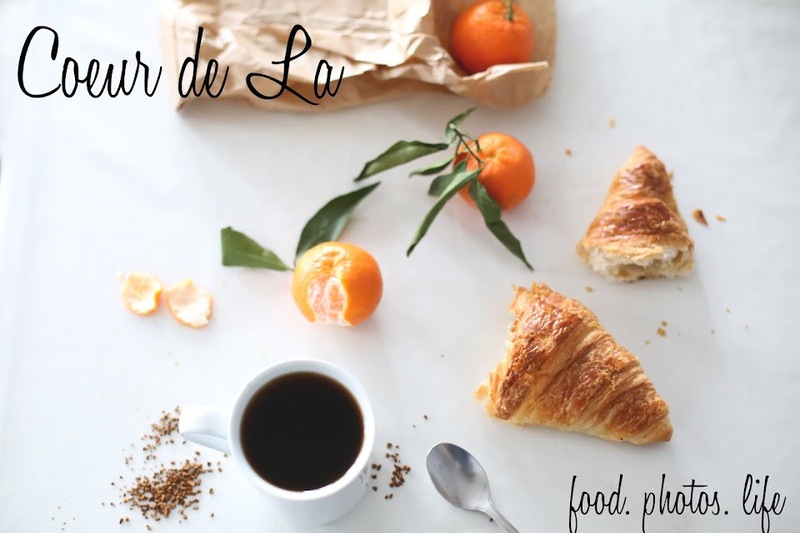 For those of you that frequent Coeur de La often you know how much I enjoy baking. And ... family and friends know how much I like to spoil others with baked goods. 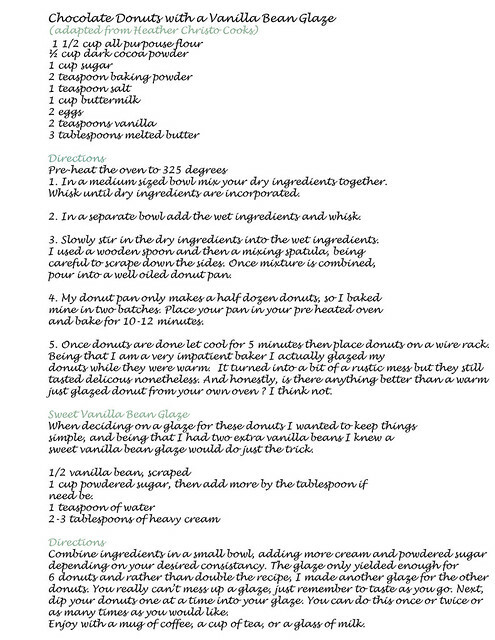 Well, two weeks ago the weather was crisp, the first rain fell, and I knew exactly what recipe I wanted to try ... a chocolate baked donut recipe I had found on the blog Heather Christo Cooks. I loved how straightforward the recipe was and approachable. So, being the impatient baker that I am the very next day I picked up a donut pan, picked up my ingredients, and got to it. 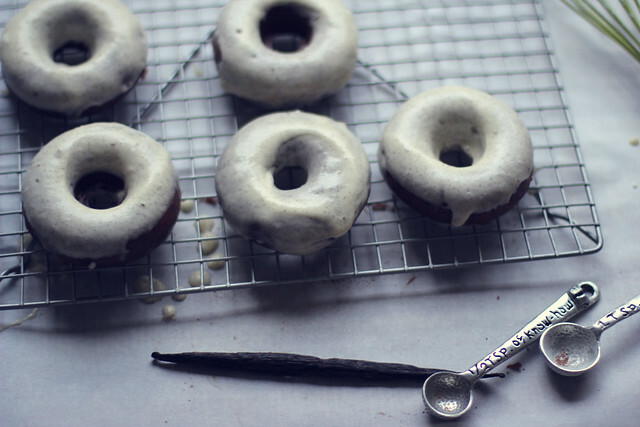 The crisp weather had me craving a vanilla bean glaze and all I could think about was dark chocolate donuts dipped in a silky smooth vanilla bean glaze. Heaven. Lucky for me, I had two extra vanilla beans, some left over cream, and a heaping amount of powdered sugar and my decision was made for me. Upon first glance I could not believe the donut perfection that came from my oven ... moist, perfectly made chocolate donuts. Donuts that reminded me of afternoon grocery shopping trips with my mom where my siblings and I would on occasion get a bag of warm, right out of the oven donut holes. I can still remember the tang of the buttermilk much like these donuts. 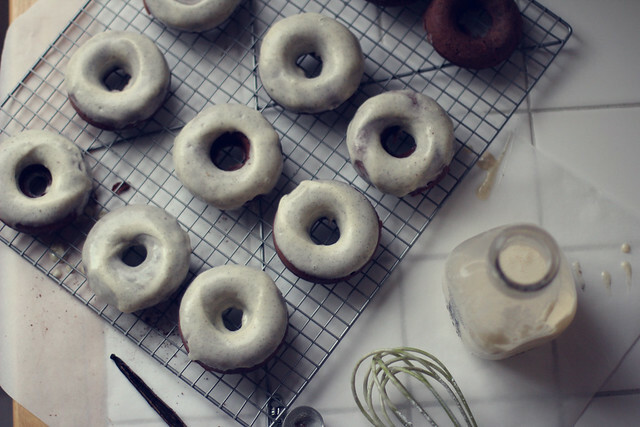 Dipping each donut into the sweet vanilla glaze with my kitchen window open the smell of chocolate donuts, fresh air, and rain engulfed my senses. Baked donuts my friends are a perfect rainy day dessert and paired with a simple cup of coffee ... I am pretty sure there is nothing quite like it. So, get your whisks ready and get on it .... start baking. Also, if you feel inclined my short essay on Morning Baking was recently published in Volume 5 of Kinfolk Magazine and I am honored I could share my story, love, and thoughts on baking with others. The list of authors, writers, and photographers that contributed absolutely inspire and amaze me ... and I am sure Coeur de La readers you will love Volume 5. You can order the Volume here ... enjoy your week and bisous. PS I just got back from a trip to Oregon that was filled with good coffee and lots of it, delicious food, and a road trip that left me entirely smitten and ready to pack my suitcases and move to Oregon. i have never made donuts. but your recipe sounds simple enough. Those look and sound amazing. I'm not much of a baker and donuts seemed way too complicated for me, but that recipe is much more simple than I expected! Holy donuts, these sound incredible! Time to find myself a donut pan! Need a donut pan too! These look pretty awesome :) They're so pretty and probably really delicious!